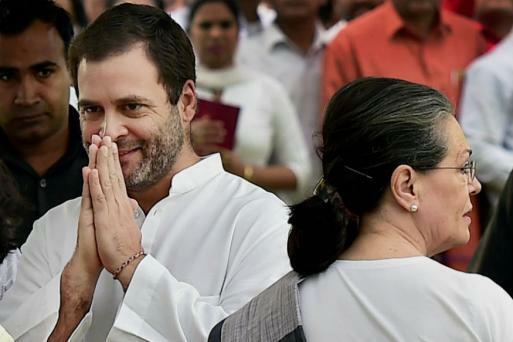 Rahul Gandhi has become the Congress President-elect with the deadline to withdraw nomination for internal polls ending at 3pm. 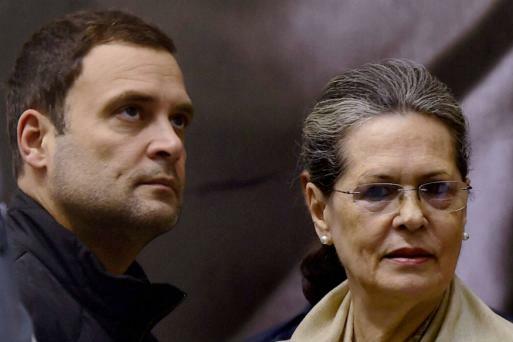 Gandhi would officially take charge on December 16 when his mother and longest-serving party president Sonia Gandhi formally hands over the baton to him, marking a generational shift in the grand old party. However, the attention has shifted to Prime Minister Narendra Modi's allegations of a secret meeting between Congress leaders and Pakistani officials. At a press conference, Congress spokesperson Randeep Surjewala hit out at Modi for his insinuation. “The Congress party and its leadership should come out with detailed facts and what was the necessity of having this meeting. Congress must explain the need for such a meeting. Beyond comprehension why the PM should apologise,” Jaitley said.“The Congress party and its leadership should come out with detailed facts and what was the necessity of having this meeting. Congress must explain the need for such a meeting. Beyond comprehension why the PM should apologise,” Jaitley said. “Why should the PM apologise for Congress' misadventure? Having done what the senior leaders of the party did and then asking for apology is not acceptable,” Jaitley said. Congress spokesperson also hit out at Prime Minister Narendra Modi for comments on former prime minister Manmohan Singh on the campaign trail in Gujarat. “PM Modi is getting more and more angry and disturbed day by day. PM Modi is not maintaining decorum of his post. Manmohan Singh who is a very decent person had to answer back to PM Modi's lie. Never in 70 years has such a disgusting lie been told by a PM,” he said. Randeep Surjewala, Congress spokesperson: I feel great to announce that Rahul Gandhi to be officially made Congress president. Congress spokesperson Salman Anees Soz congratulate Rahul Gandhi on being elected President of the Indian National Congress. India looks to you to provide decent & dedicated leadership that will steer the country on the path of inclusive politics & shared prosperity. Good luck @OfficeOfRG!, he said on Twitter. 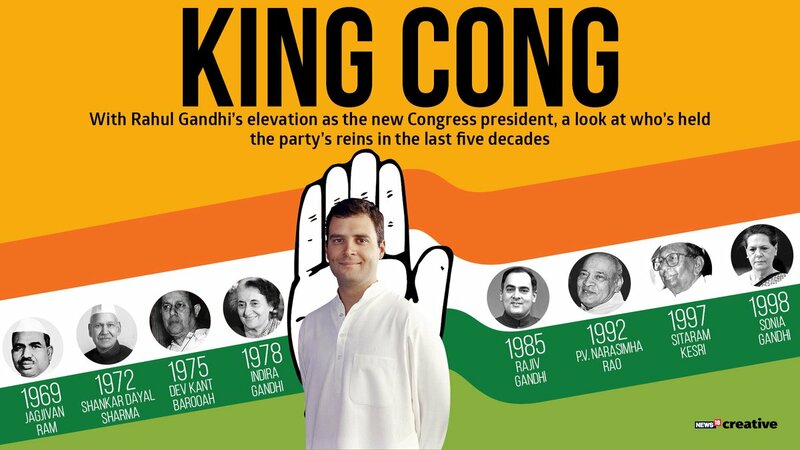 With Rahul Gandhi's elevation as the new Congress President, a look at who's held the party's reins in the last 5 decades. Rahul Gandhi is an able leader. I am sure we are going to the Gujarat elections, tells Congress leader Ghulam Nabi Azad to CNN-News18. Celebrations break outside Congress headquarters after Rahul Gandhi's election as Congress president. Celebration outside Congress office in Delhi after the official announcement of Rahul Gandhi as the Party President. The presidents of India's grand old party have written their own chapters in history. As the Congress gets ready to welcome its new chief, 47-year-old Rahul Gandhi, the stage is being set for a change in guard after 19 years. Congress national spokesperson Priyanka Chaturvedi congratulates Rahul Gandhi. Joyous moment for the party as we celebrate the appointment of @OfficeOfRG as the President of @INCIndia . Beginning of a new, energised, positive and progressive era in the party under his leadership, she tweeted. With Rahul Gandhi’s election as a Congress President, hundreds of supporters broke into boisterous celebrations outside party office in Mumbai. Mumbai Congress congratulates Rahul Gandhi on being elected as the President of Indian National Congress. "Rahul ji is a stickler for rules and both he and Sonia ji have completely stayed away from the process and allowed the election authority to function autonomously," says Congress’ Central Election Authority chairman Mullapally Ramachandran, while addressing a press conference. "Received 89 nomination papers for one candidate. 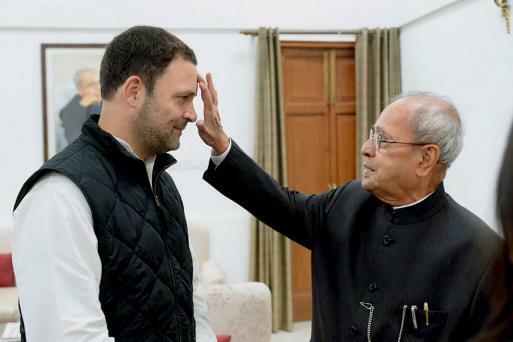 As he is unopposed, I hereby declare Rahul Gandhi as the new president of the Congress Party. We will have a formal event on December 16 at the AICC headquarters in New Delhi," says Congress’ Central Election Authority chairman Mullapally Ramachandran, while addressing a press conference. Dear Rahul Gandhi, Your party, the Indian National Congress, respects tradition. Family tradition. Your mother wants you to succeed her as party president. So you shall. Meanwhile, BJP president Amit Shah while addressing a rally, says, "Gujarat should ask Rahul Gandhi if his party supports Ram Mandir in Ayodhya or not." 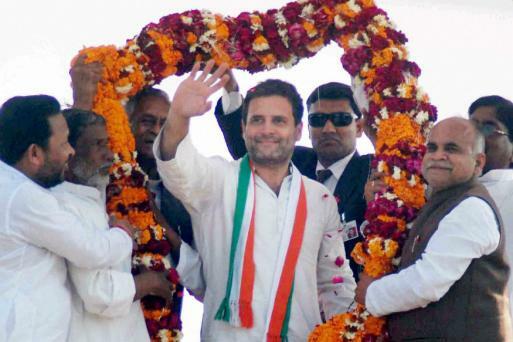 "This is a new day and a new beginning for Rahul Gandhi. He will take us away from the fractured path of the Modi and BJP. Today starts another era for the Congress Party," says Gaurav Gogoi. As the country is divided over the way Rahul Gandhi's ascent to the seat of power in Congress is being held, we look at possible, strong contenders who could be inducted into his close circle. Even as the party workers celebrate across the nation, Rahul Gandhi, the new Congress party chief is on his campaign trail in Gujarat. Party workers at AICC headquarters in New Delhi are celebrating the elevation of Rahul Gandhi as the Congress president with crackers and music. The deadline for withdrawal of nomination for the post of Congress party president has ended. Rahul Gandhi is the only person who filed his papers. According to Congress and the Making of Indian Nation, a two-volume set edited by former Congress leader and ex-president of India Pranab Mukherjee, Scottish merchant George Yule was the president of the party in 1888 and presided over the Allahabad session. Sir William Wedderburn, a former member of the Indian Civil Service, headed the party twice – in 1889 and 1910. Alfred Webb, member of the House of Commons, Sir Henry Cotton, an ICS officer and chief commissioner of Assam, and Annie Besant, who started the Home Rule Movement, headed the Congress in 1894, 1904 and 1917 respectively. The Congress party has also been helmed by some illustrious people – including Mahatma Gandhi, Sardar Vallabbhai Patel, Subhash Chandra Bose, Abul Kalam Azad and Sarojini Naidu. Womesh Chandra Bonnerjee, who wore several hats as journalist, jurist and politician, was the president of the first session of the Congress held in what was then Bombay in December 1885. Dadabhai Naoroji was the second. Of the 15 people who led the 132-year-old Congress party post-independence, four belonged to the Gandhi-Nehru family. When Rahul Gandhi takes over as the president, he will be the fifth. The Nehru-Gandhi clan was at the helm of affairs of the party after independence for 38 years: Nehru for three years, Indira Gandhi and Rajiv Gandhi for eight years each, and Sonia Gandhi for a record 19 years. The controversy sparked off after Rahul Gandhi was unanimously elected as party president with no other contenders.